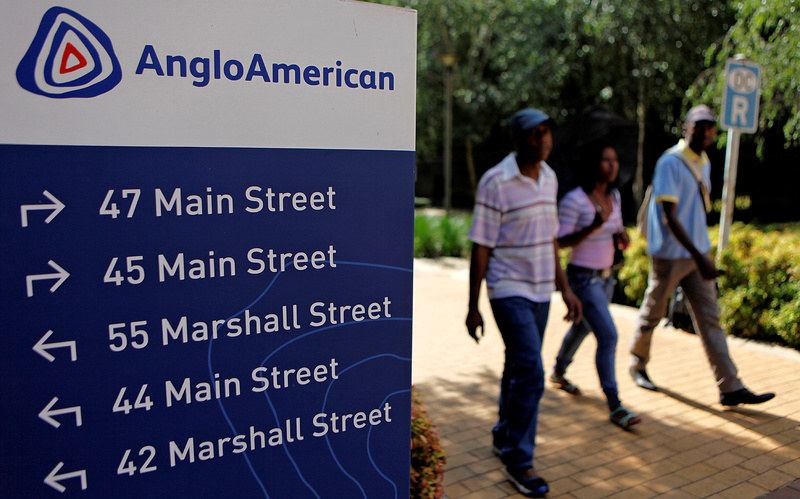 People walk past a board outside the Anglo American offices in Johannesburg, South Africa, January 8, 2013. The board of South Africa’s Public Investment Corporation (PIC), the $150 billion state workers’ pension fund that holds 12.94 percent of Anglo American, resigned en masse on Feb. 1 due to allegations of wrongdoing against four directors. Anglo American, in which Vedanta’s Anil Agarwal holds a 19.35 percent interest, reported a 4 percent rise in EBITDA for 2018 on Feb. 21. Anglo American said 2018 EBITDA rose to $9.16 billion from $8.82 billion a year earlier, driven by higher prices and volumes and lower costs. The figure beat analysts' average estimate of $8.7 billion, according to I/B/E/S data from Refinitiv. Anglo American shares fell 1 percent to 20 pounds by 0846 GMT on Feb. 21.